Sometimes, when feeling lazy, writers fish for some other writer's brilliant quotation to open an article, and I admit I looked far and wide to find one about the Nutmeg State, but came up real short. Not even the Yale Book of Quotations offers a single remark about Connecticut, though it has two on Ohio. And the state motto--Qui transtulit sustinet ("He who transplanted sustains")--must be the least inspired in the Union. Not even favorite daughter Katherine Hepburn or Missouri emigré Mark Twain ever said anything noteworthy in print about their state. So let me try: Connecticut is Hollywood's ideal of New England at its prettiest, its richest and its smartest--rather like Hepburn herself--with movies centered on picturesque country homes and inns in films as disparate as "Christmas in Connecticut," "Bringing Up Baby," "Mr. Blandings Builds His Dream House," "Parrish," "Summer Stock," "The Awful Truth," even "Beetlejuice" and "The Stepford Wives." 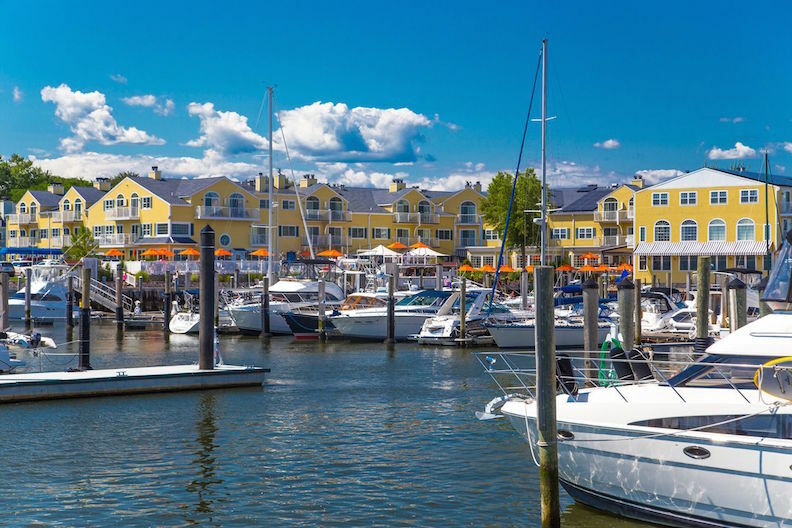 Such idealization is not without foundation, most beautifully evident in eastern Connecticut towns like Essex, Old Lyme and Old Saybrook, all easily visited over a weekend. Old Saybrook, which is principally one long Main Street, dates back to 1624, with Dutch origins, then as Saybrook Colony in 1635 it came under English rule. In 1701 the Collegiate School of Connecticut was chartered there, before moving to New Haven a decade later to become Yale University. 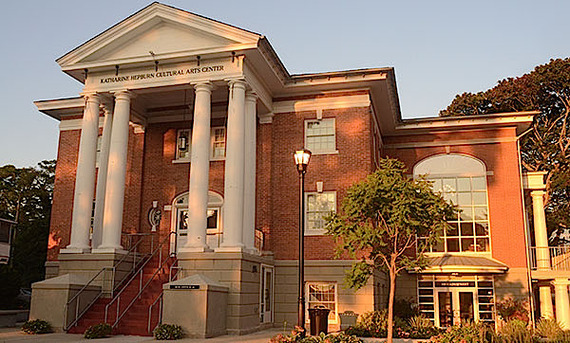 In 2009 the town fathers converted the old town hall to the Katharine Hepburn Cultural Arts Center and Theater(above) . Kate lived in nearby Fenwick, and my wife and I were delighted to stay in a cozy, fireplace-warmed room named after the great lady at the Saybrook Point Inn and Spa, which has been recently restored and expanded with a main house, a large guest house across the road, and a marna, all of them set on the edge of the fast-running Connecticut River and Long Island Sound. 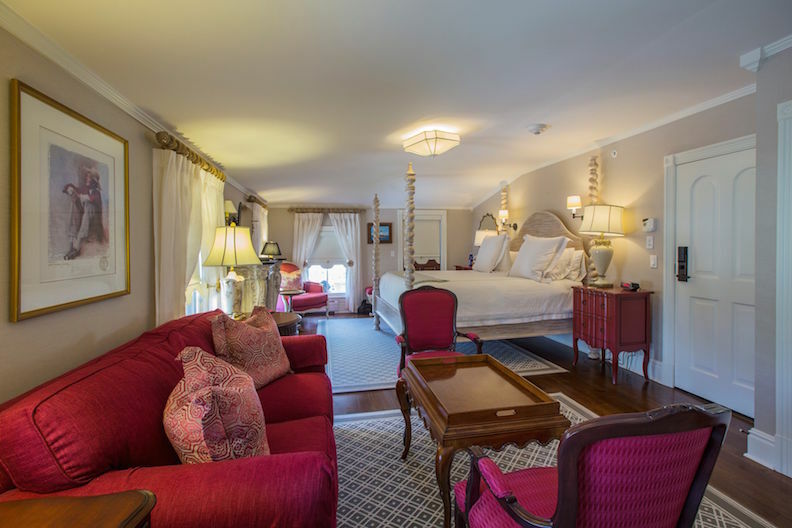 The Inn has been here for 13 years and for a while back in the last century had a rep as a popular spot for show biz stars and mobsters to get far away from it all, thereby lending the Inn a notorious glamour. But it's always been an elegantly appointed place drawing guests from all over the U.S. and, increasingly Europe and South America. With a seasoned pro named John Lombardo as new general manager, a state-of-the-art Sanno Spa and indoor pool, conference and banquet facilities, and a renovated and reconfigured restaurant called Fresh Salt, the Inn has never been better run or maintained. The Hepburn Suite (above) is in Three Stories, an Italianate Victorian home with eight rooms, each with a private balcony, exquisite furnishings that marry New England tradition to all the modern comforts (including a large bathroom with heated floors, separate bath and shower), and a full breakfast each morning. We enjoyed a fine dinner at Fresh Salt, somewhat more casual than it used to be, so there are now a lot more sweaters than blue blazers in the dining room. Like everywhere else at the Inn, Fresh Salt looks out on the water, and as the days grow longer, the twilights are earlier, the sunsets later, making it an ideal place to dine in the area, whether or not you're staying at the Inn. My wife and I began with Raw Bar offerings in the form of yellowfin tuna sashimi (above) with wonton matchsticks, creamy avocado, ginger soy dressing, mango salsa and cilantro ($14.95); delicious, if a little overdressed. 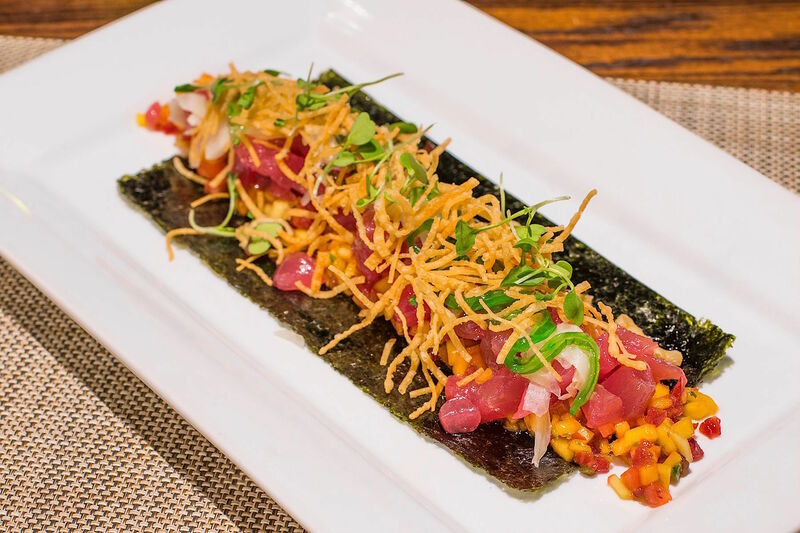 There are other Asian elements on the menu, such as crisp calamari with a sweet Srirachi chili glaze, spicy cherry peppers and julienne of fresh vegetables and scallions ($13.95). A Mexican note was found in the juicy duck confit nachos with pear-tomato concasse, micro-arugula greens and Connecticut goat's cheese, with a port reduction and crispy wonton ($12.95). You'll find a great proportion of ingredients used are from Connecticut and New England. We managed to sample three main courses, and portions are very generous. We raved about a dish called Swordfish "Mrs. Tag" style ($29.95), which began with superb swordfish glossed with good olive oil, garlic, a little lemon zest, Italian parsley and fine breadcrumbs, with a Parmesan-spinach risotto and sautéed zucchini--again, a bit of piling on the plate, but it really was a terrific dish in all its components. Their devotion to Connecticut ingredients aside, chef John Cortesi and chef de cuisine Gese Rodriguez are to be applauded for using Colorado lamb. Pork osso buco ($25.95) came with a well-wrought polenta sweetened with figs and sided with field mushrooms and a truffle sauce. 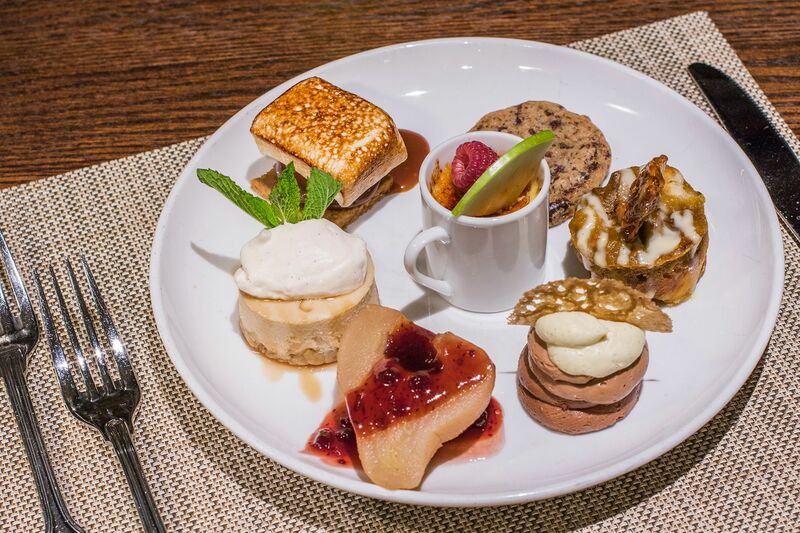 One assumes that at any time of year New England desserts are going to be homey and irresistible, and pastry chef Stephanie Schroeder's do not disappoint. "Indoor S'mores" ($9.95) are made with housemade marshmallows, Graham cracker cookie, salted caramel sauce and chocolate Bavarian cream; a vanilla-scented poached winter pear with a Cassis reduction ($8.95) and a ricotta maple-laced cheesecake ($9.95) were wonderful, but you might just want to go with the three chocolate chip cookies dipped in white chocolate ($7.95). Then sit back and enjoy a cup of cider laced with Jack Daniels honeyed whiskey. Mr. Lombardo is duly restocking what is now a modest wine list, whose prices are very fair and include some Connecticut spirits and beers. The liquor list is a good one, with eight bourbons and six single malt Scotches. I'm sure the late Grande Dame Hepburn, who swam in the Sound every day, would have approved of the room named after her and might even have recommended the Inn for a location wherein to shoot a Hollywood movie in rooms once frequented by her peers. If Hollywood don't make 'em like they used to--Kate Hepburn included--the Saybrook Point Inn certainly does its best to epitomize all the old charms and elegance of a state that deserves a much livelier motto.